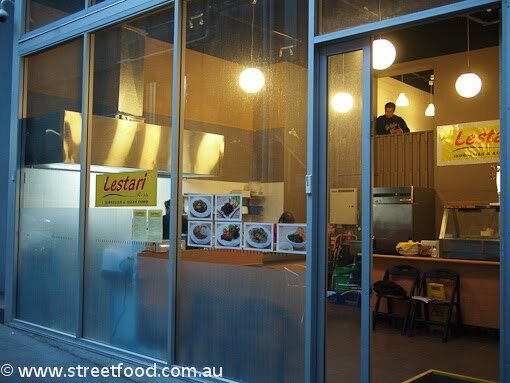 We've been on an Indonesian bender lately so we were ecstatic to stumble upon Lestari, a new little Indonesian hole-in-the-wall joint tucked away in an alley off Harris Street/Broadway in Ultimo. We waddle into Broadway to check out this new Indo joint we stumbled upon last week on our way to the Malaysia Festival. 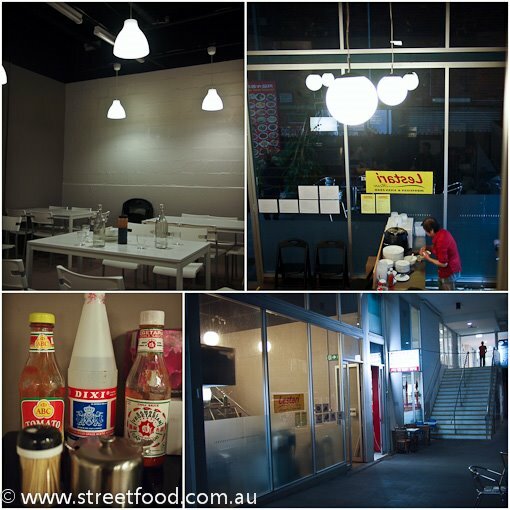 It's called Lestari and it's tucked away in a little alley off Harris Street, right near Broadway, between the Agincourt pub and ABC TV. You can also get to it from Broadway, via a little arcade that has signs out the front for the excellent Miyama Japanese noodle bar. Inside Lestari Resto is modern, basic and clean. There's also some tables outside, we are looking forward to eating outside during daylight saving. Lestari has been open for less than a month and already they seem to have plenty of fans, there was no shortage of Indonesian students, hipsters and families on both of our visits. There's lots of babi (pork) on the menu so if you're after halal food you might want to try Cafe Joy a block away on Quay Street instead. Ayam Bakar - Grilled Chicken with Chili & Sweet Sauce - $8. It was good though not super-wow. I ordered the breast quarter by mistake, methinks the maryland quarter would be juicer and extra delicious. 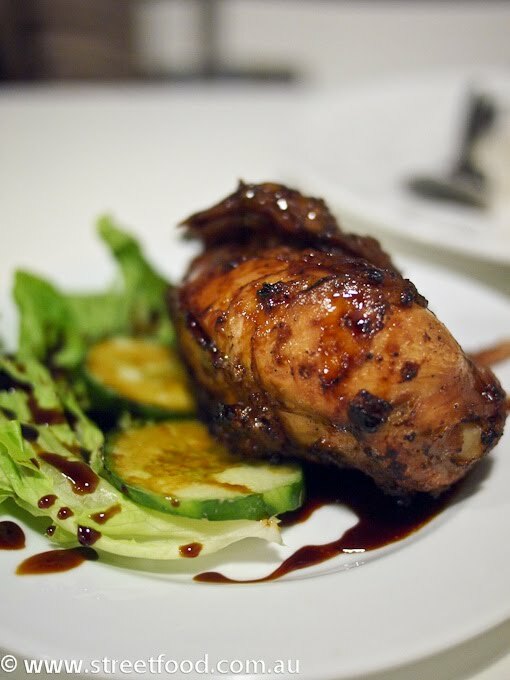 I'm keen to come back and try the Ayam Rujak - grilled chicken with a sweet, spicy sauce. 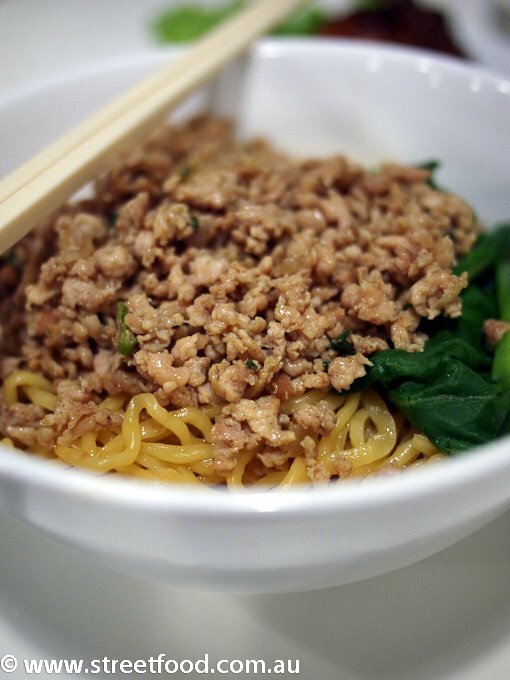 Bakmi Komplit - Bakmi Noodles with the Lot - $9. Insanely delicious boiled egg noodles that have a lovely buttery, cooked-in-stock taste. 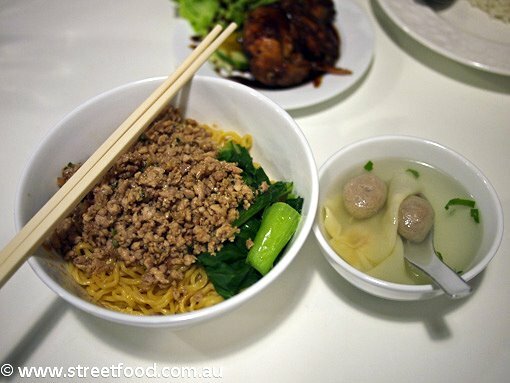 The bakmi noodles are served with minced pork on top and a clear baskso\wonton soup on the side. 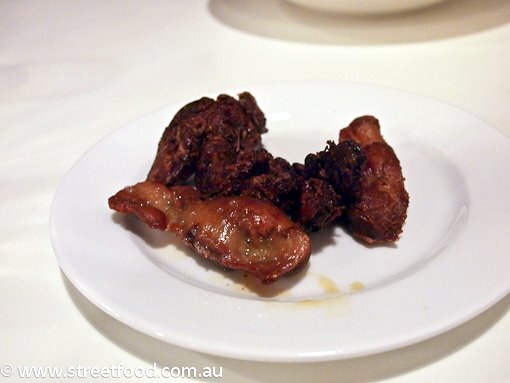 Ati / Ampla Goreng - Fried Chicken Liver / Giblet - $3. Miss Chicken loves her offal. 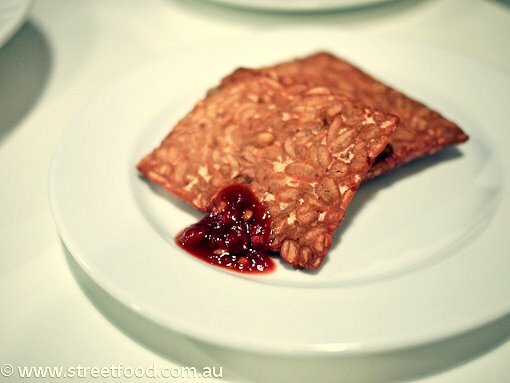 Tempe Goring - Fried Tempe (fermented soy beans) - $2. Lestari is at Shop 94 / 732 Harris Street Ultimo. We plan to eat our way through the menu and will add new photos to this post each time we return. Lestari has moved a couple of doors down since our last visit, it's still in the same obscure little lane, and still serving up good Chinese-Indo food. Back again for Bakmi Ayam - $8, Indonesian chicken flavoured egg noodles, topped with chopped chicken, mushrooms and veggies. Pour the soup over the lot or have it on the side. It's a great lunch and a generous serve, but not a killer bakmi ayam. 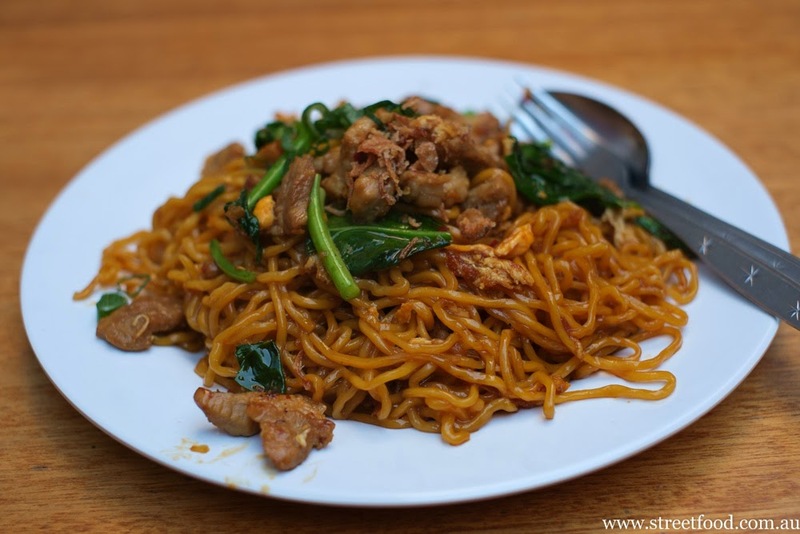 One of our Indonesian readers recently suggested that Indo restos in Australia always put too much chicken in their bakmi ayam, it should be a delicate balance of ingredients, not a protein fest. Not amazing but still delicious. Nasi goreng Jawa - $9 with egg. The Lestari folks tell me they are most famous for their fried rice and we believe them. The rice has lovely smokey wok and peppery flavours. We order medium spicy and it has a nice spicy tang to it. Awesome. Love how the fried egg is crisped at the edges but lovely and runny in the middle. Back for some bakmi goreng (about $9) - yellow egg noodles stir fried in a little something sweet and sticky, kecap manis we guess. Yummo. 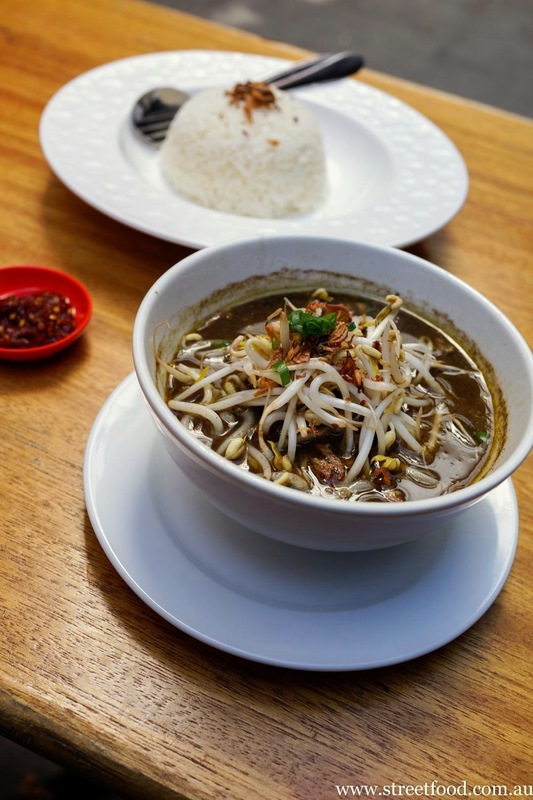 The rawan (about $9) is another favourite here, a dark beef soup with a rich sweet broth and rice on the side. If you feel like something light yet full of flavour, and a little rehydrating, Lestari's rawon highly recommended. or as they say in indonesia, BAGUS! so good we've gone back twice in the last week, thanks for the recommendations! Thanks for the reminder - we've been meaning to come back and eat our way through the menu. Love the old boss lady! Yes, she's so great. Chatting to everyone. She was singing and dancing last time I went in. You should try their most popular menu item i.e. Bakmi babi panggang aka. Pork BBQ Noodle. You'll love it.